One of my favorite people in my five years of travel throughout the United States is Dr. John Stratton, Executive Director of the Ashland Center for Nonviolence. He is a peacemaker of the highest degree, working on helping to end conflict of all forms. 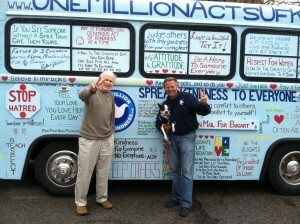 As I headed north through Ohio, Ashland was a must stop for the Global Kindness Tour. ***Happy Birthday today to Patti, a beautiful earthly angel. This entry was posted on Friday, April 25th, 2014 at 8:00 am	and is filed under Kindness. You can follow any responses to this entry through the RSS 2.0 feed. You can leave a response, or trackback from your own site.